USGS OCEANOGRAPHER STUDIES COASTAL CHANGE USING RASPBERRY SHAKE! 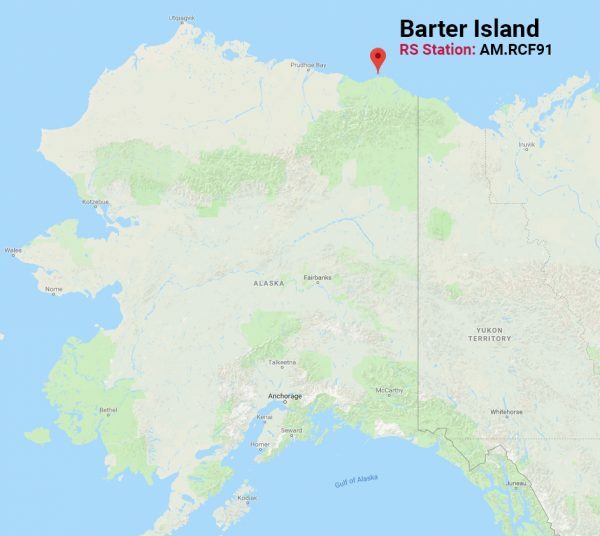 Shawn Harrison a fellow Shaker and Oceanographer for the U.S. Geological Survey (USGS) has devised an interesting experiment on Barter Island in Arctic Alaska, aimed at analysing the oceans impact on coastal change, using the Raspberry Shake. Arctic Alaska is one of the most susceptible areas of the USA to the effects of warming climate. Both coastal bluffs and low relief coastal plain areas are susceptible to the impacts of increased storm intensity and sea level rise. Coastal bluffs serve as polar bear nurseries and as protection for some native settlements, and low relief coastal plain areas are where much of the energy production infrastructure is located. Identifying and quantifying these effects are made particularly challenging by the remote nature and harsh climate of the Arctic. Oceanographer, Shawn Harrison, works primarily on remotely detecting coastal change, as part of the USGS’s greater coastal change hazards program. The USGS Coastal and Marine Geology Program provides scientific information on coastal land loss and gain including bluff failure, changes in ocean waves and water levels, flood hazards, the state of near-surface permafrost, and movement of subsurface water. Scientific data is collected and analyzed to help evaluate and forecast how changing conditions will impact sensitive habitats, communities, and critical infrastructure. So how does the Raspberry Shake fit in? 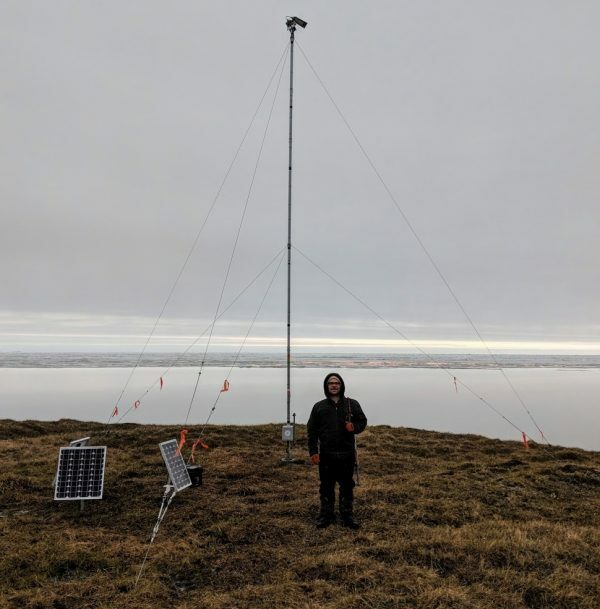 “Recently, we’ve been experimenting with integrating the Raspberry Shake into a few of our stations as a tool to remotely sense ocean wave characteristics. The idea is that as ocean waves impact the nearshore, the vibrations they generate can be felt by the Shake. We think that we can use the signal collected by the Raspberry Shake (or any seismograph) to quantify some of the wave characteristics.” – Shawn Harrison. 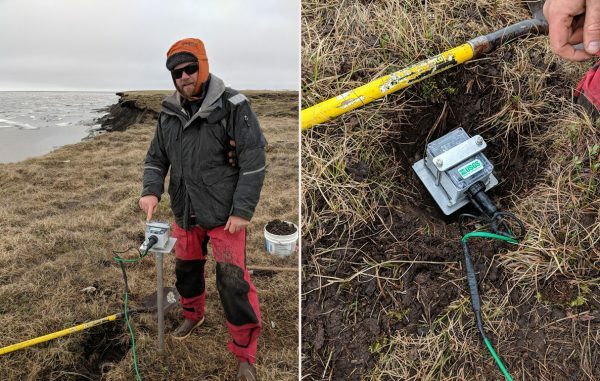 USGS scientist Cordell Johnson mounts the Raspberry Shake on an aluminium pole and buries it beneath the tundra. Shawn’s research plays a vital role in tracking climate change impacts. 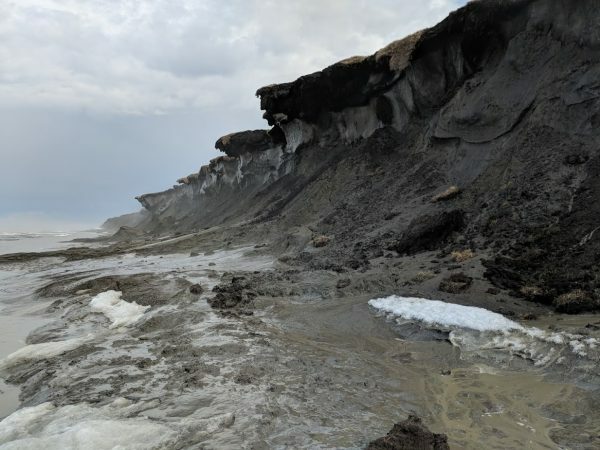 A major consequence of warming climate is permafrost thaw, which threatens infrastructure, alters habitat, increases fire risk, changes nutrient and sediment delivery to the coastal ocean, and enhances greenhouse gas release. Warming climate has already dramatically reduced the thickness and annual duration of sea ice, rendering the Arctic US Exclusive Economic Zone more accessible to other nations’ vessels and the coastlines more vulnerable to erosion from wave action and higher and more frequent storm surges. Time-lapse photography of Barter Island in Alaska during three summer months in 2014 showing the pack ice melting and subsequent impact to the beach and cliffs from storms. You can see Shawn’s Raspberry Shake station AM.RCF91 in action on station view and see imagery of the location here. At Raspberry Shake we wish Shawn Harrison and his team the best of luck with his research and would love to hear about future developments and findings. A special thanks to USGS Oceanographer Shawn Harrison and colleagues Li Erikson and Cordell Johnson for their contribution to this article including, links, photos and content.